Thaarai Thappattai directed by Bala, is about a Karagattam troupe owned by Sannasi and his love with Sooravali. Sasikumar gives a consummate performance. The misery shows in the actor’s facial expressions and stance most effectively. Varalaxmi’s part in this movie is very, very well played out; she makes you feel that she is actually suffering from the pain that she received. While not for those who have a low tolerance of pain and violence, Thaarai Thappattai is must-see viewing for any serious filmgoer for its technical expertise and the fully committed Bala and actors. It has the Bala combination of pain, despair, revenge, and justice. The violence wasn’t thrown in there for no reason and it was very realistic. It’s one of those films where you purely and genuinely feel sorry for the main characters. Character development was really well done and it wasn’t hard to follow the storyline at any point of the film. The visuals, and soundtracks are stunning, and it absolutely draws you into the atmosphere. Some of the camera moves are just extraordinary. Together with the great camera work and the great performances of both Sasikumar and Varalaxmi this movie is class. Everything fits together, the music, with the shots and the situation and the whole storyline. The background score is absolutely breathtaking. This film transports the viewer to the situations. The natural landscape and lighting each play irreplaceable roles of their own. 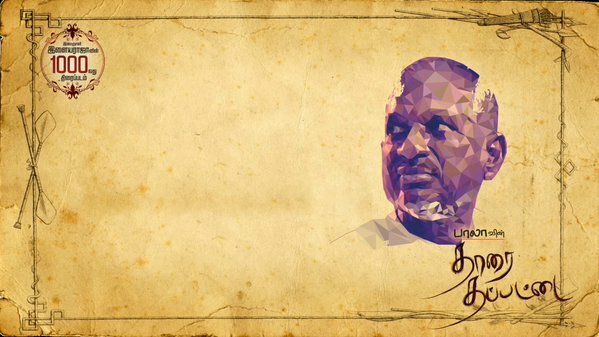 Outstanding work by Ilayaraja – Bala. Note: This is the 1000th film of Maestro Ilayaraja. The soundtrack is unexpected, dramatic, keeping on its own rhythm, yet adding for better to the overall drama of the movie. It is like the emotionally hard hitting Alejandro González Iñárritu films: there is a long void and then similar sharp tragic notes of strings. There were minor let-downs in the movie like we can expect the tragedy and the outcome, sooner or later. Anyway, Bala is as always brilliant, just brilliant and bold enough to be himself always. I assure you, it will be well worth the time. It is an emotional piece of art. A Spectacular Emotional Piece of Art but a Difficult Watch.